The moment Twilight fans have been waiting for has arrived: the New Moon panel and the premiere of two clips starring Taylor Lautner and Robert Pattinson's abs. Here's what we were able to decipher, over the screaming fans. 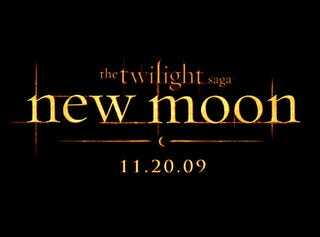 After waiting hours in line and sitting through trailers for gorey slasher films, Twilight fans were rewarded with two clips from the sequel New Moon. Did they get their money's worth? Only if they like staring at half-naked vampires and werewolves. At La Push, a long-haired Jacob is teaching Bella how to ride a dirt bike. As he tells her to release the clutch slowly, she sees an apparition of Edward at the handlebar. She falters, nearly falling off the bike. Jacob is about to halt the lesson, but she says, "Let me try again." This time, she takes off, but she sees another apparition of Edward, and she watches him as she rides by. Apparently, Jacob's lesson didn't include keeping your eyes on the road and not on phantom ex-boyfriends. She starts to lose control, crying to Jacob for help. "Bank it!" he shouts. "Hit the brake!" The bike catches on the edge of the path and Bella goes flying face-first into a rock. Jacob hops on his bike and catches up with her. He pulls her up and tsk-tsks, "No more bikes." Bella touches the blood streaming from her forehead. "Oh, I'm bleeding," she says, and then automatically adds, "I'm sorry." He gives her a bemused look. "Are you apologizing for bleeding?" "Oh yeah, I guess I am." Of course, all this business of blood and rocks is a mere set-up for the most fanservicey moment of the clip, when Jacob pulls off his shirt and just stands there for a moment, showing off all the hours of gym work Taylor Lautner put in for the film. The pause is, I assume, to allow sufficient time for the screaming to die down. Finally, he bends down and uses his shirt to wipe the blood from Bella's brow. She looks at him dazed with what could be lust or a concussion. "You're so beautiful," she tells him. The audience seems to agree. And he replies, amused but wary, "How hard did you hit your head?" Alice — looking like an undead Audrey Hepburn in her sun-shielding scarf and glasses — is driving through the narrow streets of Venice, while Bella is having a panic attack in the passenger seat. Bella asks why everyone outside is wearing red robes and Alice explains that it's for the Saint Marcus Day Festival, the perfect opportunity for Edward to reveal himself and provoke the Volturi. When she can't drive any further, she kicks Bella out of the car to chase down Edward. Bella protests, but Alice insists, "You have to do this, Bella. You're the only one he won't see coming." Bella races through the streets toward the Piazza Grande, shoving red-robed celebrants out her way as she goes. Finally, she reaches the piazza and spots Edward, in the entryway of a building. Slowly, he slips off his dress shirt. His abs are much paler than Jacob's, but the crowd doesn't seem to be complaining. As he steps forward to reveal himself in all his sparkly glory, Bella cries out, "Edward, don't!" But Team Jacob scored a point during the Q&A session with director Weitz. When asked how filming in Vancouver compared with filming in Portland, Taylor Lautner complained that both places were cold and wet. "Don't get me wrong, they're both beautiful, but it's no fun to be filming there with your clothes off." They're ladylike shoes... There's nothing wrong with that, there's nothing bad about [taking over a franchise from another director], if someone gives you a chance to make a movie that you know a lot of people are going to see. I've inherited a great cast, a book that people love, a screenwriter who adapted the first one successfully and did a great job of taming the huge amount of material from the first one. At first the notion of a male director was a tough sell to fans of the books. Little do they know how much like Bella I actually am. We all identify with being broken up, except for the part where you get them back in the end, it rarely works like that in real life. We asked Weitz about how he approached the challenge of presenting the Volturi, the ancient vampire society, in the new movie. He said casting was the key piece of that puzzle. "I got a chance to add to this cast, and get Michael Sheen, Dakota Fanning, Christopher Heyerdahl (who's an extraordinary Canadian actor) and Jamie Campbell Bowers. If you get actors of that caliber, it's easy for you." As for the look of the Volturi's lair, "I wanted to take every cliche possible, and throw it out. You're not going to see Dracula's castle, and dripping wax, that sort of thing... Or if you do, you'll see it briefly on your way to something totally unexpected." I think my hair is kind of like this character in the movie. It's flowing, it's good though, because it's untouched. She doesn't want to change, she's so terrified of anything being different. By Breaking Dawn, it's just going to be at my feet.